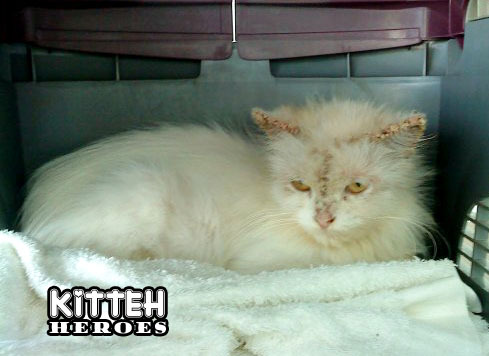 She was skinny, had at least three species of mites living on her (hence the crusty ears), two broken teeth and gastritis. It cost almost RM300 (not counting medical fees when the carer sustained a scratch that got infected) and about a month to nurse her back to health. She’s still skinny but she’s more or less in good shape and ready to meet someone who will love her and look after her for the rest of her life. because she’s technically still a kitten, she does require more attention than an adult cat: she is quite active, likes playing and is very affectionate (although of course it’ll take a little time for her to get used to a new owner). 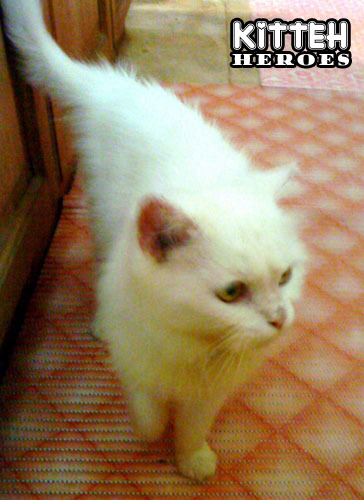 I’d rather she go to someone who has had Persians before, because grooming is not easy. Because she’s white I’d recommend she gets wiped with a damp cloth at least once a day (otherwise bits of her will turn beige). She doesn’t mind being wiped, but she hates baths. New owner must have their own pet carrier. Lucky already has a collar and I’ll give a few cans of cat food to get her started. If the new owner wishes to continue having Dr. Audrey as Lucky’s vet – which I’d definitely recommend – I can write a letter to Primavet to authorise the transfer of the account to the new owner (and they don’t need to worry about her previous treatments – everything so far has been paid for). If you are in Kuching and are interested in adopting Lucky, you can contact Rin at azreen_zahira[AT]yahoo.com for further details. You can also reply to this post. 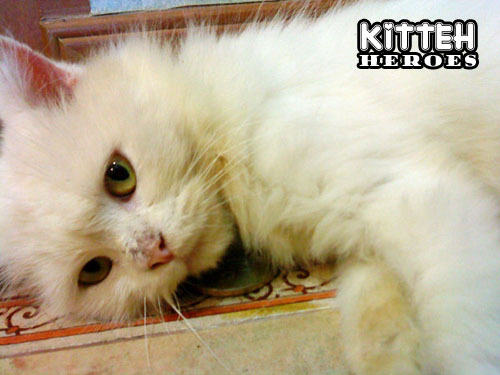 Lucky is free to adopt as long as you promise that she’ll be well cared for. 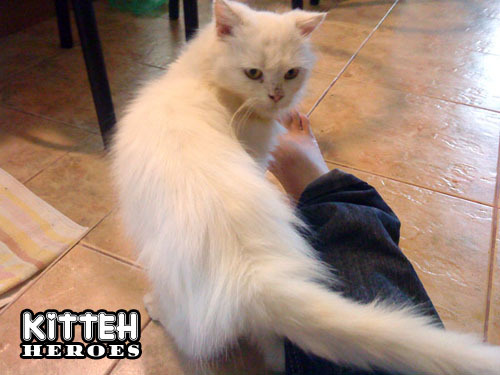 Kitteh Heroes is a small, newly-established group of cat lovers in Kuching who are interested in the welfare of cats. The primary carer is Rin. The rest of us help in any other way we can – like bearing some of the expenses or helping find new homes for the cats-in-care. There is a Facebook group here. You can help by spreading the word. Link to this post on your blog, tweet it, repost it on Facebook, email it to someone who might be interested. Rehoming Lucky means there’s room for the next cat we find. You can also give us your spare change, because fostering cats and making sure they get all their shots cost money.